UW professors Zhang (second from left) and Kirschen (third from right), with Tsinghua University professors Zhang (far left), Kang (third from left), Chen (second from right), and Zhu (far right). University of Washington electrical engineering professors and CEI member faculty Daniel Kirschen and Baosen Zhang hosted faculty from Tsinghua University (Beijing, China) for a symposium on smart energy systems on December 8, 2017. The Tsinghua group was led by Chongqing Kang, professor of electrical engineering and Chairman of the Executive Committee of the Department. “Our two groups have collaborated for a number of years because we have a common interest in developing tools and techniques that support the operation and development of a sustainable, economic, and reliable supply of electrical energy,” Kirschen said. Brian Johnson presenting on novel modeling techniques for networks within low-inertia power systems. At the symposium, Brian Johnson, who will join UW electrical engineering as Washington Research Foundation (WRF) Innovation Assistant Professor of Clean Energy in spring 2018 from the National Renewable Energy Laboratory (NREL), described novel modeling techniques for networks within low-inertia power systems. As large conventional power plants are replaced with small energy generators, the inertia of the system – its ability to handle fluctuation in supply and demand of power – decreases. Each individual generator requires its own DC-to-AC inverter, so the grid becomes exponentially more complex in addition to its increased volatility. Johnson explained that the power and voltage characteristics of inverter-generator systems can be aggregated using his technique, allowing operators to model the grid similarly to present conditions. Guiping Zhu, associate professor and associate dean of electrical engineering at Tsinghua University, spoke about China’s present challenges in optimizing large-scale battery storage. “Wind power is intermittent, fluctuating, and has strong temporal and spatial correlations,” she noted, so she and her team created a model using real data from 34 Chinese wind farms. By simulating outputs, optimal storage capacity can be calculated, and model costs can be compared. These principles are promising for implementation throughout a renewable grid. 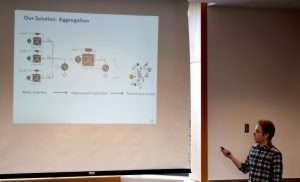 Ning Zhang, associate professor of electrical engineering at Tsinghua University, presented on multiple energy systems, in which energy inputs (coal, gas, hydro, wind, solar) interact to produce utility outputs (electricity, cooling, heating). He explained a complex model in which power converters within “hubs” can be optimized, such that a building, city, or region fulfills its utility demands at the lowest total cost of energy generation. In 2015, UW, the State of Washington, Tsinghua University, and Sichuan Province formalized a relationship when the parties signed a “2+2 MOU” to support collaborative research on clean energy and sustainable cities. As part of this agreement, in September, Tsinghua University’s Energy Internet Research Institute (EIRI) and UW’s Clean Energy Institute signed a collaboration agreement and EIRI pledged two seed fund projects: one on low emission transportation led by civil and environmental engineering professor Yinhai Wang, and the other for research led by professors Jim Pfaendtner (chemical engineering) and Kirschen on multi-scale engineering of clean energy systems. Article courtesy of the University of Washington’s Clean Energy Institute. Originally posted at their site.